Tiger Woods produced flashes of his old magic as Rory McIlroy showed little spark and struggled to a three-over 74 on his debut in the Valspar Championship in chilly Tampa. The Co. Down man (28) said on Wednesday that he'd "be happy to go to Augusta tomorrow" and feel like he had a chance. But he hit just six fairways and only seven greens in swirling winds on the testing Copperhead Course at Innisbrook and despite having just 26 putts, he was near the back of the field for strokes gained putting after missing twice inside five feet. After opening with nine straight pars, the world number 12 bogeyed his 11th hole, then made a clumsy double-bogey seven at the demanding, 605-yard fifth, his 14th. In trouble from the tee, he had no chance of hitting the green in regulation and compounded his mistake by three-putting from 15 feet. Even after holing a 20-yard bunker shot for his lone birdie at his 16th, he bogeyed his final hole with a wedge in hand, missing the green and a four and a half footer for par. Canadian Web.com Tour graduate Corey Conners (26) made five birdies in four-under 67 to lead by a shot from South Korea's Whee Kim, Kelly Kraft and Nick Watney. But Woods (42) is only three behind after fading a delicious, low five-iron to 19 inches at the 199-yard 17th en route to a rollercoaster, one-under 70 and a share of eighth place. Winless since 2013, he got within two shots of Conners after mixing four birdies with two bogeys in his first 11 holes and despite battling a swirling wind all day, he was 11th both for strokes gained from the tee and around the green. 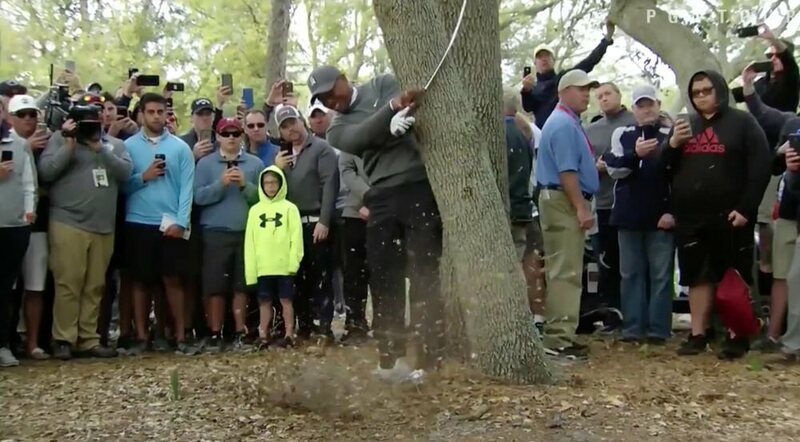 While bogeyed the 12th and 13th and smashed his forearm off a tree en route to a spectacular par-save at the 16th, he looked like a man who could be a threat at the Masters. "I'm getting a little better piece by piece and today was a very good test of all my things that I tried to hit. Wind's out there, it's howling and swirling, it's tough and felt like I really controlled the ball well." He certainly outshone his playing partners with Henrik Stenson failing to make a birdie in a 74 and Jordan Spieth struggling again with his putting to post a 76. As for the rest of the Irish, Shane Lowry made two birdies and two bogeys in an encouraging, level par 71 that keeps alive his hopes of the 15th place finish he needs to qualify for the WGC-Dell Technologies Championship in a fortnight. The Offaly man excels on tough courses and was ranked 10th for proximity to the hole on a day when the field averaged 72.8 and just 27 players broke par and only seven broke 70. He started well, holing a 20 footer at the 11th, his second, and turned in one-under. His first bogey came at the first, where he drove into a fairway bunker and then missed a three and a half footer for par. But despite missing an 11-footer for birdie at the second and a six-footer for par at the third, he got up and down for par from 80 yards after finding another fairway bunker from the tee at the long, par-five fifth. He then hit a 138-yard approach to two feet at the seventh to get back to level par and might have dipped into the red had he holed from 15 feet at the eighth or 12 feet at the ninth. Graeme McDowell is 68th after two bogeys in his last four holes saw him sign for two-over 73 while Pádraig Harrington fell victim to the Snake Pit, finishing double-bogey, bogey for a 76 to share 122nd with Seamus Power on five-over. On the European Tour, which will stage an event in Saudi Arabia for the first time early next year, Argentina's Emiliano Grillo shot a course record, seven-under 65 to lead the Hero Indian Open at a treacherous DLF Golf and Country Club in New Delhi. The venue was so testing that delays for rulings meant that 24 players could not finish their rounds on a day when Darren Clarke birdied his last two holes for a level par 72 and a share of 37th. "You have no idea how difficult the course is," said Grillo, who leads by two shots from Spain's Pablo Larrazábal, Italy's Matteo Manassero and American Paul Peterson. "I think anywhere else it would have been close to a 59 or something." Larrazábal’s round is all the more impressive after his start to the day, being roused by a phone call from a European Tour official after his alarm failed to go off with just 38 minutes to go until he teed off from the tenth hole. 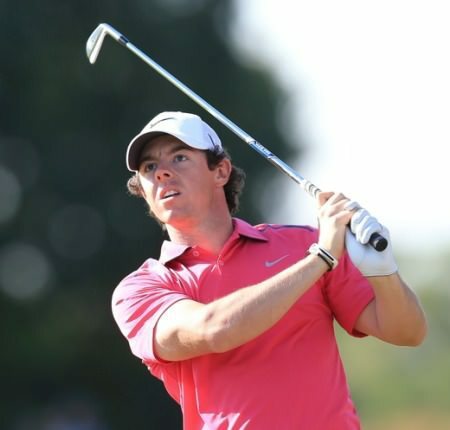 He managed to calm his racing heart after a dash through the Delhi traffic in time to recover from a double-bogey on the 15th hole to turn in 34 and make five birdies in a row from the fourth. Meanwhile, the European Tour will add a new tournament to its early-season Desert Swing in 2019 when the Kingdom of Saudi Arabia hosts an event for the first time. The prize money and title sponsor will be revealed in May with the tournament scheduled for Royal Greens Golf and Country Club in King Abdullah Economic City, 150km north of Jeddah, from 31 January to 3 February. On the Staysure Tour in the UAE, American Clark Dennis carded a seven-under 65 to lead the Sharjah Senior Golf Masters by three shots with Headfort's Brendan McGovern 15th after a 72 Ronan Rafferty 34th after a 75 and Des Smyth and Philip Walton 44th after 76s. In amateur golf, Europe trails Asia-Pacific 5.5- 4.5 after the opening day's play in the biennial Bonallack and Patsy Hankins trophies at Doha Golf Club in Qatar.